Proactive in their goal to help guests create balance through wellbeing and mindfulness, Hyatt unveiled their second Miraval Wellness Resort in Texas earlier this year. Surrounded by the county’s lush oak and cedar trees and overlooking the picturesque Lake Travis, the spa and wellness resort offers a place in which to centre your mind, body and soul. Within the 220-acre setting you’ll find 117 guest rooms and suites, a Life in Balance Spa, a 10-acre farm and ranch, and a Life in Balance Culinary Kitchen. In alignment with the resort’s wellness goals, the guestrooms and suites have been designed with a soft, neutral palate, hand-crafted accessories and sleep-enhancing amenities. The Life in Balance Spa covers 20,000-square feet, with 30 treatment rooms, a spa pool, relaxation rooms, a salon, sauna, steam room and retail boutique. The options to unwind are endless, from body renewal rituals to a Pranayama-Dīna experience that combines breathing techniques with a floating massage. They say the kitchen is the heart of the house, and this is certainly true at Miraval, where workshops with a focus on plant-based cooking and wheat-free baking and healthy cooking classes are offered. There is a subtle theme throughout the hotel design, and that is its focus on sustainability – this can be seen in every detail, from the all-natural bath amenities in reusable packaging found in the suites, to the Cypress Creek Farm visit, which provides lessons in sustainable farming practices and responsible agricultural growth. 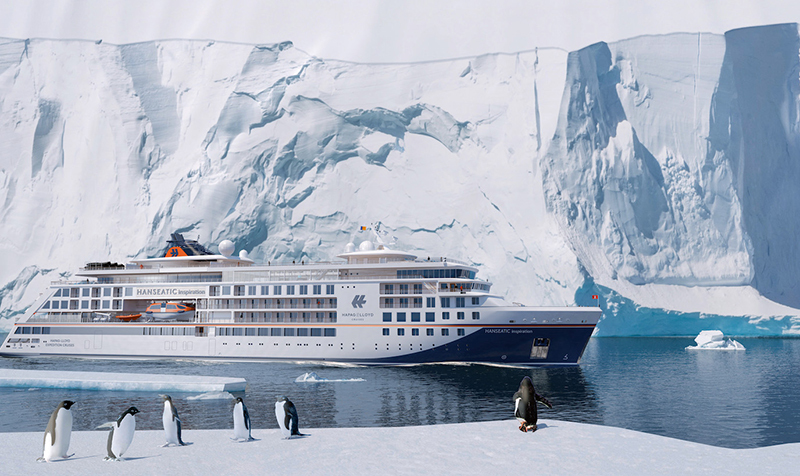 With the popularity of cruise holidays forever on the increase, luxury cruise and expedition liner Hapag-Lloyd Cruises have announced that low-pollutant marine gas oil (MGO) will now be used on all routes sailed by their expedition ships. While the company has always adhered to the use of low-sulphur fuels which are mandatory throughout the Antarctic region, in the past they have also voluntarily used marine gas oil in other ocean areas such as the Artic or Kamchatka, where the fuel laws are not as strict. Hapag-Lloyd Cruises have several environmental practices in place, including travelling at an average speed considered to be environmentally-friendly, having the bow thrusters and stabilisers run on environmentally-friendly bio-petroleum, and being equipped with seawater desalination technology to produce clean water. Their expedition ships, the HANSEATIC nature, HANSEATIC inspiration and BREMEN, will gradually make the move to exclusively using low-pollutant marine gas oil from July 2020, and will be joined by their newest ship, the HANSEATIC spirit, which is due to join the fleet in 2021. For more personalised information tips and advice, or to book these incredible holiday experiences, contact your local TravelManagers’ personal travel manager here.